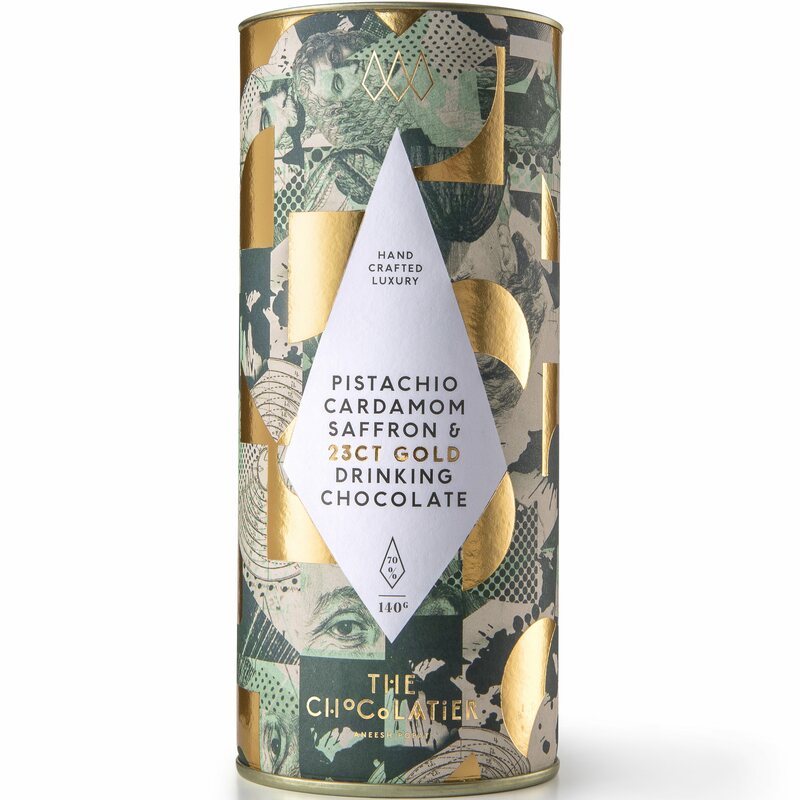 Offering our most regal drinking chocolate with flakes of the finest edible 23ct gold, rich saffron, aromatic cardamom and shavings of pistachio, for a truly majestic chocolate experience. Enjoy by simply melting into your choice of milk or hand blending into water for a smooth and decadent chocolate sipping experience. Enjoy by simply melting into your choice of milk or hand blending into water for a smooth and decadent chocolate sipping experience. This drinking chocolate is free from milk, eggs, alcohol, gluten and is suitable for vegetarians and vegans. 70% Dominican Republic Dark Chocolate (Cacao, Sugar, Cacao Butter, Emulsifier: SOYA Lecithin, Vanilla), Muscovado, 55% Chocolate Flakes (Cacao, Sugar, Cacao Butter, Emulsifier: SOYA Lecithin, Vanilla), Cocoa, PISTACHIO (8.8%), Cardamom (1.8%), Saffron (0.9%), 23ct Edible Gold (0.05%). Minimum Cocoa Solids 70%. This product is dispatched by The Chocolatier. This item has a shipping weight of 250g.